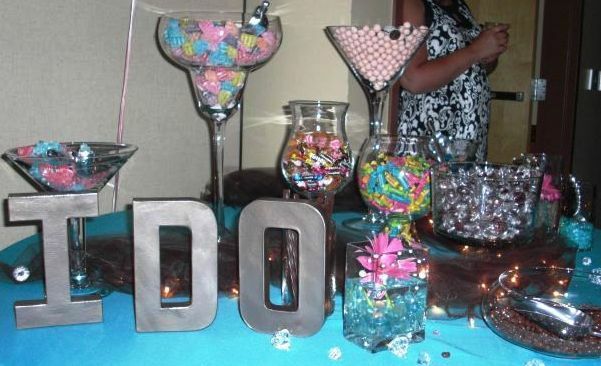 One of my favorite parts about doing wedding sweets catering was creating "candy bars"! You may have seen these at weddings or parties. Kids love them. I do too! If you don't know what to get your guests for a departing gift, let them make bags and take them home. You can tie a little message card to each bag, thanking them for celebrating with you. This was a Fall themed candy bar. The candies were pretty easy to find for this one. The craft stores have a lot of colored chocolate wafers and pastel blues and pinks for baby showers etc... If you can't find the colors you need, you can always order various candies (like any color m&m's) online. This was from my wedding in October '08. My mom did this candy bar for us. I love the "I DO" letters she used. She just bought these at a craft store (Jo-Ann's, I think) and spray painted them to fit the Fall theme. Those are mini bags in the front right for guests to take the candy to go. The picture on the far left says, "Eat, drink and be married". I thought that was so cute! I would always use fabric and tuck Christmas lights into it, then wrap it around the table. You can find the scoops and glass bowls/glasses at craft stores (Jo-Ann's, Michael's, and Hobby Lobby). Don't forget to print a coupon or take one from the paper before you leave to save extra! It might take a while to accumulate all the perfect glasses and bowls. It was fun to find different things to add sparkle to the tables, like the glass diamonds and flower vases in the picture above. I would love to make another candy bar sometime. There is so much that you can do to make them pretty and customizable. We moved into our house in May of this year. We've done some updating to our kitchen to make it more enjoyable to eat and cook in. We still have a lot of work ahead of us, but it is already so much better than it was. The updating process was halted when we found out that baby number two is on the way. I'm too scared to paint, prime, or stain anything! I can't wait to paint the cabinets! Here are a few before and after photos. That heater needed to go! This fridge was definitely NOT awesome. Thanks, table cloth curtain, for all your hard work, but we won't be needing you anymore. AFTER! This isn't much of an "after", but it will be soon! We don't have a before picture of this. This small space made it tough to find anything. We bought this at meijer.com. I searched for what I thought looked like the best stand alone pantry for our price range. We love it! We have a lot more cabinet space, and our food is not crammed into a small area anymore. We have a few more things to do like painting these cabinets, replacing the hardware, painting the wood doorway trim, working on a backsplash, etc... I don't really know what I'm going to do with the large wooden area above the cabinets. Any ideas? I didn't want to show the whole room, because it's definitely still a work in progress. I will do some good before and after pictures when we finish the entire room. Check back to see some of our other room updates! I'm not sure it's possible to love on our babies enough to not want to go back and hold them close to our chests again like when they were newborn. I have that bittersweet feeling most of us moms get when we wish we could pause time...BUT, I'm not sad that my baby just turned one, because I am so excited to watch him grow, run, play, and say all the funny things kids say, in the coming years. I am so looking forward to watching his personality unveil itself. 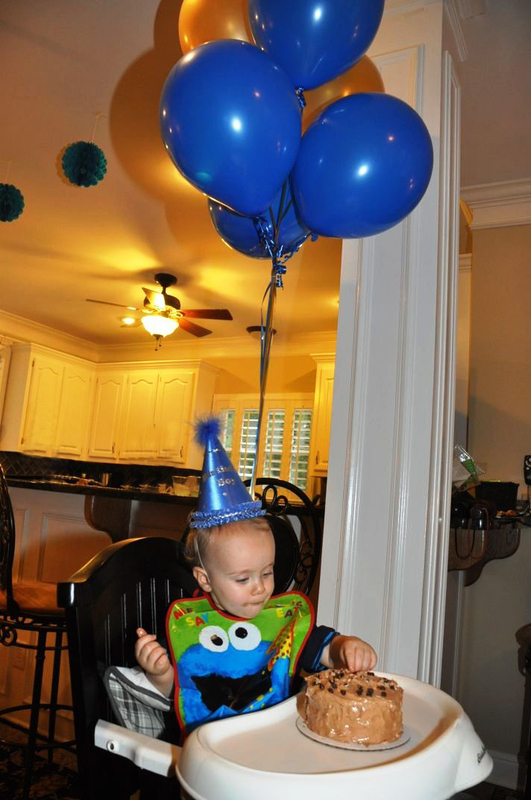 I've always loved cookie monster, and thought the theme would be great for a little boy's 1st birthday party. Noi from Noi Gifts & Gourmet made this awesome and delicious cookie monster cake. I always said I'd make his first birthday cake, but there was no time. I was so grateful to have Noi make it. It was so cute! (chocolate cake with chocolate chips) For anyone who has made cakes before...she did not use any rice krispie treats or fillers...ALL CAKE!! That was probably a challenge. I made this cookie monster cookie cake and cookie monster cookies. I like the eyeballs on top of the cookies more than I do on the blue filling (as I showed in the cookie monster cookies original post). Everyone guessed how many cookies (cookie crisp) were in the jar. I can't believe 119 cookies fit in there! That cookie monster is a pinata, which was one of the only cookie monster decorations we could find in stores. I love him. Maybe we'll take a swing at him in a couple years. You know all those month stickers we use to document our baby's growth with pictures? I figured I would put them to good use and hang them in order from 0-12 months to show how much Levi has changed in such a short period of time. It's really amazing how much babies grow! I cut scrap book paper I already had to make the backing for each of the pics, then pinned them up with clothes pins. I got a Cricut machine for my birthday, and had a lot of fun making paper decorations. I used the birthday bash cartridge to make all the cut-outs. That machine is awesome! Levi had a lot of help with opening gifts from cousins and friends. Good thing, because I don't think he knew what to do :) It's also good, because I take FOREVER to open presents. I feel sorry for all the people who had to sit through my wedding and baby showers. He made some new friends. Let the cake smashing begin!! It took a long time to get to this point and a little help from his mama to dig into the cake. He is a dainty little eater. He LOVED the cake, and would've easily eaten the whole thing. I was probably pretty annoying to all my friends when I was little. I would drag whoever I could to the creek, whenever they complied with my pestering, to find crawdads, scope out snake holes, and simply be in the water, hopping from rock to rock. There were so many fun things I did in the neighborhood I grew up in. Most of my friends were boys, but that was fine with me. There was a winding hill that I loved to ride my bike down...with no hands. My dog, Sally, was always by my side. She followed me all over the place without a leash (or a bag for picking up her messes). We were free to roam to the far reaches of the neighborhood. My parents had a loud alarm that they would sound when it was time to come home. Sometimes we heard it, sometimes we didn't. Our backyard was fenced in, but you'd usually find my brother, sister, friends, and I playing in the front. We climbed trees, swung on a tree swing, dug for Indian money and arrow heads, jumped on the trampoline, rode big wheels up and down the sloped driveway, caught lightning bugs, had dance competitions, dug in the sandbox, colored everything with sidewalk chalk, and played huge games of capture the flag with kids from every street. We had fun. I remember one day when I saw a creepy man in a windowless, white van. I always looked out for "kidnappers" or strange vehicles, mainly because I thought it was fun to pretend to be tough and quick by telling everyone I'd spotted a weirdo. It was good that I was that way on the day there really was a scare. The van was parked on the corner of the cul de sac next to our yard. The man had dark sunglasses on, and was staring in our direction for an uncomfortably long time. We all ran inside to tell my parents. Nothing happened. I hope Levi has this type of mentality when he is outside playing in the coming years. Of course, I'll be watching him closely as long as necessary, but one day I'll probably let him ride his bike down the street, just like I did. It's a hard thing to think about. I know that might sound funny, but it does seem like times have changed. Is it true that we used to see more kids playing outside? Is it really because of video games or a lack of desire to explore the outdoors? OR is the world perceived as a more dangerous place now? I'm pretty sure more kids stay indoors now than they used to...or at least they play in their backyards more frequently than we did in the 80's. I know a lot of it depends on the neighborhood you live in, too. I want to feel the freedom to let Levi "have fun". I don't want to be an overprotective parent, but I do want to be protective. I do know that we want to fence in the yard so our soon-to-be toddler won't try to make a break for it, and run into the street! What are your views on this? Anyone with kids feel totally safe letting your kids freely roam around the neighborhood? Are we more afraid to let our kids play outside than our parents were? Recently, my mom and I had a craft day. One of our projects was to make wreaths: she made two wreaths for her front doors, I made one for me, and also one for my Grandma. I had never made a wreath before, but it wasn't as hard as I had imagined. I just took forever to do it! My mom whipped hers out in about ten minutes, while I slowly pondered the placement of each flower and leaf. She's a pro! The wreath on the left is for my Grandma and the right one is mine. I started with a straw and grapevine wreath. I wrapped the straw wreath in a pretty sheer ribbon to give it a more elegant look. There wasn't enough ribbon, but that can be covered. I discovered mistakes are really easy to hide. I glued the ribbon and flowers on with a hot glue gun, and used the long glue sticks. Here is all the fake foliage I started with. I don't usually like the look of artificial flowers, but I these stood out to me. I tucked the stems through the ribbon, puncturing the straw, then added a ton of glue to each stem. It's a little tricky to get them to stick without a lot of glue. The grapevine wreath is a little easier to stick the stems into than the straw wreath. I love how they turned out! I'm still looking for a place to hang my wreath. Our front door has a little window that I don't want to cover. I think it'll be an indoor wreath. I love to see all the different wreaths people are creating on pinterest. I think we'll make some Fall/Winter wreaths with a modern look on our next craft day. The only wreath bases I could find in the stores were grapevine, straw, and styrofoam. What do you like to use for your homemade wreath bases?